I recently became aquainted with half of the writing duo of A Terrible Beauty (Valerie Ganzevoort) and was interested in her story and her book, so I invited her and her father to share a bit about both. I think you might find it interesting. V.M. Devine is the pen name for the writing-collaboration of Valerie Ganzevoort and her father, Michael Mahony. 1. How did you come to write a novel together? Valerie’s Response: My Dad had started on the book during a break that he was having from writing a series of theological books. He had always wanted to write a murder mystery and decided to give it a go. I was helping him proof read some of his theological work and so asked to look at the new novel early on in his writing. After a few discussions, he asked if I would like to help him write it and we started to reengineer the book and worked on it from there. 2. Since you both live in South Africa, why did you chose Dublin, Ireland, as the primary setting for the book? Mike’s response: The setting came from the place where I grew up. As kids we used to play in the James Joyce Tower in Dublin, Ireland – this was long before it was restored to the formal museum it is today. The plot and characters were drawn from my own personal journey of life which encompassed living in Ireland, Nigeria, England and South Africa. 3. Why did you decide to write a murder mystery? Valerie’s Response: My Dad has always read Agatha Christie and P.D. James so, for me, growing up and rummaging through the bookshelves for something to read often resulted in my reading them as well. We both enjoy the ‘puzzle-like nature’ of a murder mystery, where the book is not just a story but a mystery to be solved. We have particularly enjoyed hearing from readers who followed certain red herrings in the story or told us of their delight ay having picked up on certain clues which were important in solving the murder. Though, to date, we have not heard from any reader who has successfully guess the murder, so if anyone does guess correctly, we would love to hear about it. 4. The Penname for the collaboration is V.M Devine, where did this come from? The V and the M comes from our initials (Valerie and Mike) and the Devine is Mike’s mother’s maiden name, so a surname that felt fitting for both of us. 5. Have you started writing another book? Mike’s Response: Yes, I have recently returned from a family visit to Ireland where I visited the scene of our next murder, the Chester Beatty Library. I had arranged to meet with the Operations Manager of the Chester Beatty Library, Derval O’Carroll who was somewhat intrigued by the prospect, eventually even helping me to select the specific location within the library where the murder will now take place! While in Dublin, I also met with the curator of the Dublin Writers Museum (Robert Nicholson) who is also the curator of the James Joyce Tower & Museum in Sandycove where our current novel, A Terrible Beauty – the murder at Joyce’s Tower, by V. M. Devine, has its setting. The book has since been catalogued into the museum and is on permanent display at the James Joyce Tower for visitors and tourists to flick through at their leisure. This was a great moment for us as the book ‘found its home’ in own setting. 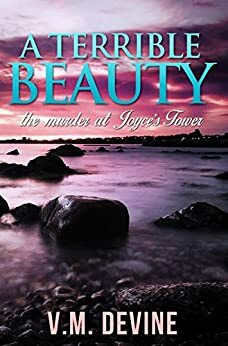 You can pick up A Terrible Beauty: The Murder at Joyce’s Tower on Amazon. And remember, if you don’t have an ereader or kindle, you can pick up a free app from Amazon to read it on any device. Michael hails originally from Dublin, Ireland but has spent the greater part of his life in Johannesburg, South Africa. He is a retired IT guy. Valerie was born in Johannesburg. In between exploring her interest in Children’s Fiction, and writing in collaboration with her dad, she is primarily focussed upon raising her three very young children. “A Terrible Beauty – the murder at Joyce’s Tower” is V.M. Devine’s first novel.